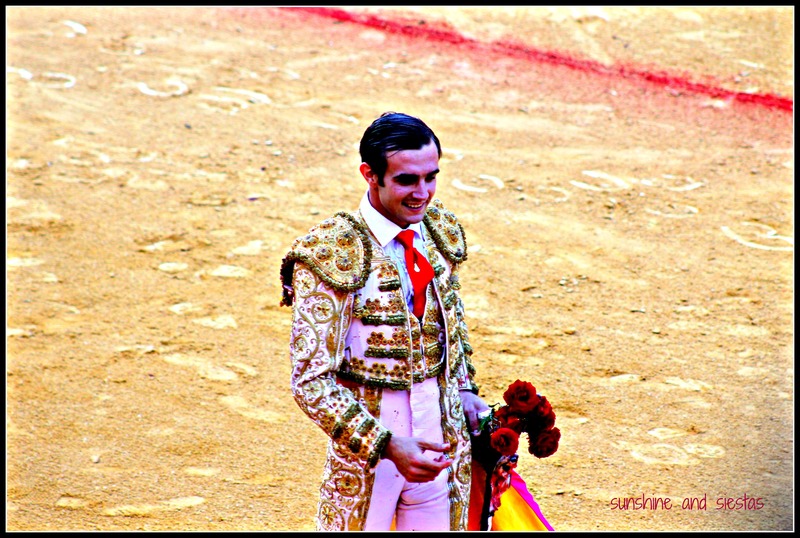 Like it or not, bullfighting is intrinsic in sevillano culture. 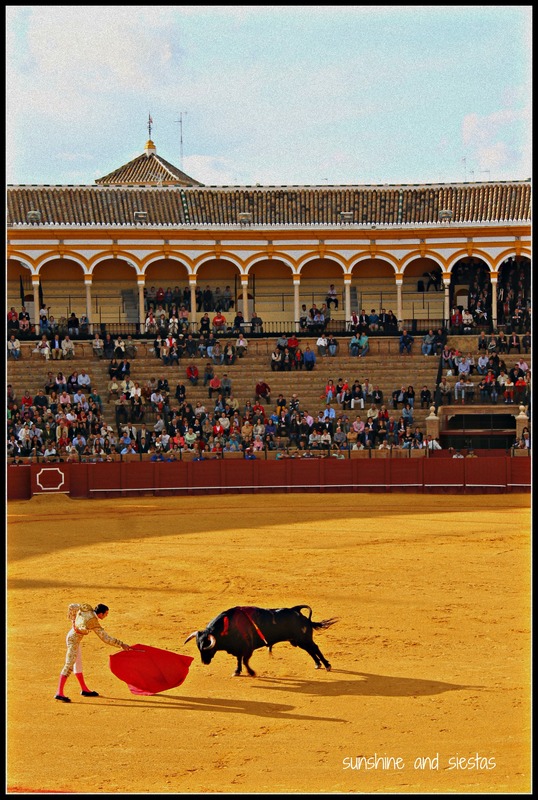 Hemingway’s favorite pastime is both hemmed and hawed and considered a great art form, but this piece of southern folklore is alive and well in Seville’s Maestranza bullring, which hosts some of the most revered festejos and brings in the biggest names in bullfighting. Aside from the gory part of bullfighting, I personally love the image of a bullfighter. Slight body, slicked, jet-black hair, traje de luces glimmering in the afternoon sun. What’s more, the plaza de toros in Seville is de leyenda – the mustard yellow and white colonnades offset the bluest of skies and the yellow albero dirt that lines the elliptical plaza. The pomp and circumstance of the whole thing is as breathtaking as a Virgin passing silently over the Guadalquivir River during Holy Week, alit with candles. And, really, I just wanted to bring Camarón along to get closer. We enter the gates of the Maestranza by way of a narrow, uphill alley, the same the bullfighters take past snapping camera flashes. The toreros are celebrities in their own right – rich, often handsome and ready to face death by way of a 500-kilo animals with two piercing horns and plenty of mala ostia. Our seats are in the sol – sunny – section, but the cloud cover in the late afternoon means we’re pleasantly comfortable and have paid 20€ less for the event. People surround us on all sides – old men in caps with their grandchildren next to them munching on sunflower seeds, wealthy sevillanos with sideburns and fancy seat covers, guiris like us with cameras poised. The clip clop of horses sounds in the inner bowels of the arena below me. Pages with long plumes enter the ring as the band plays from high in the sombra section. 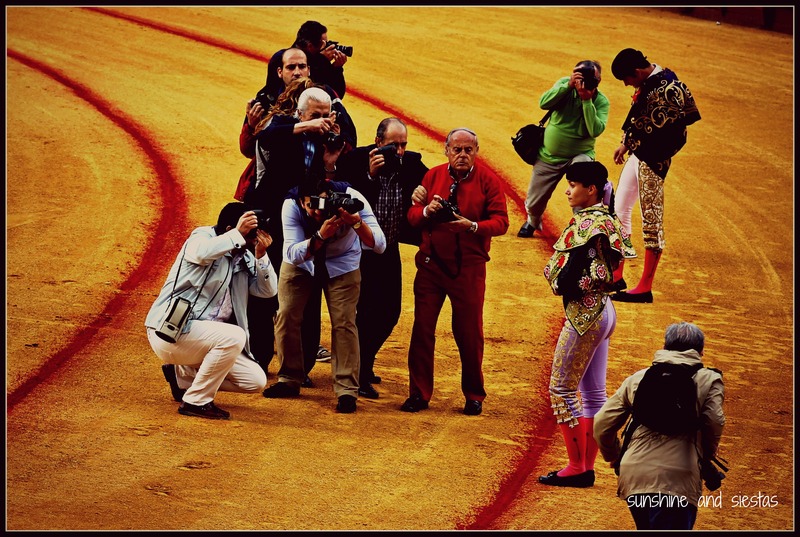 They present their hats and the bullfighters enter gallantly, a cluster of photographers crouching as the toreros gaze at the crowd before them. We’ve come to a novillada, where young bullfighters gain experience on smaller bulls and often in bullrings of a lesser division. 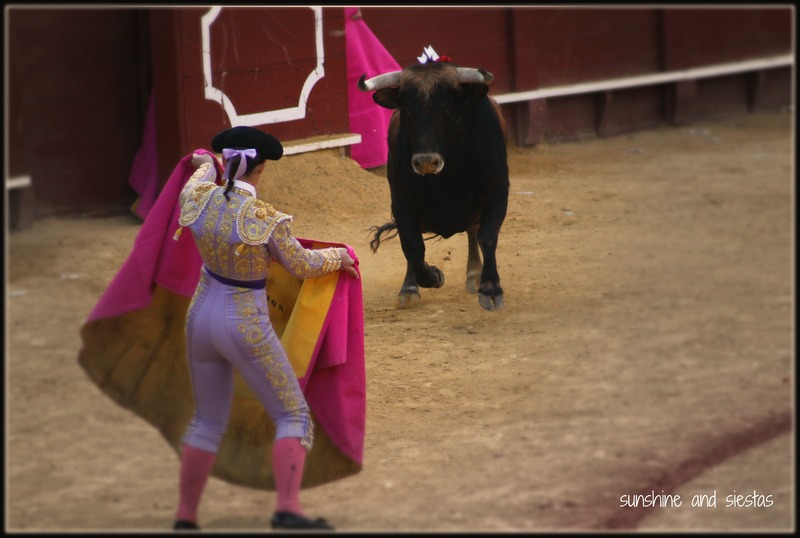 But here, in the Maestranza of Seville, the bulls are agile, strong and weigh in at almost 500 kilos. We’ll see each – Conchi Ríos, Emilio Huertas and Álvaro Sanlúcar – fight two bulls. One of the opponents will die, and the other survive. At 7pm sharp, the Puerta Gayola opens and the sounding of two cornets pierce the silent arena. Out comes Medialuna, and his statistics are announced on a placard over the door. Despite his size, he seems a bit flojillo as Conchi measures him up. Bullfighting is traditionally a male sport, but Conchi is treated equally, her cuadrilla or band of picadores, banderilleros and mozo de espada as grand as any. 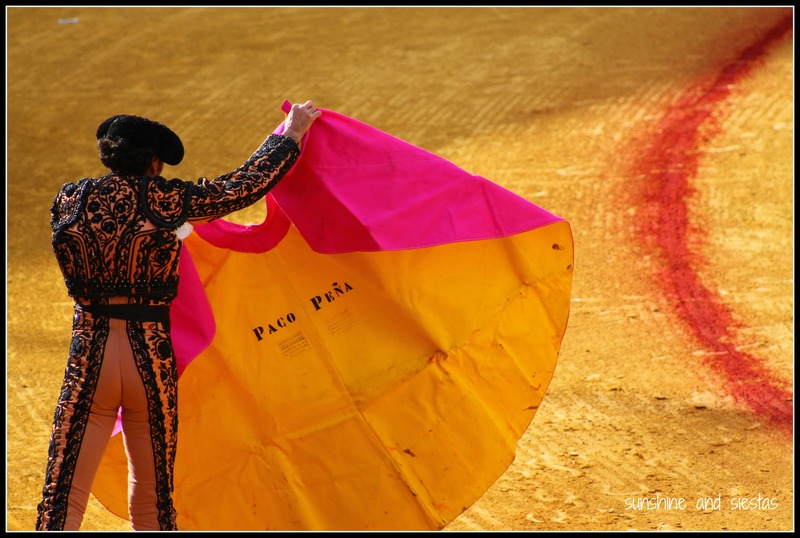 Using a heavy pink and yellow cape, called a capote, they measure the bull’s strength though a series of passes known as a verónica during the first third of the act. Conchi has a matador’s body and only the lavender colored ribbon in her hair gives away her gender. The clip-clopping commences and the picaderos enter the ring through a gate adjacent to our seats. 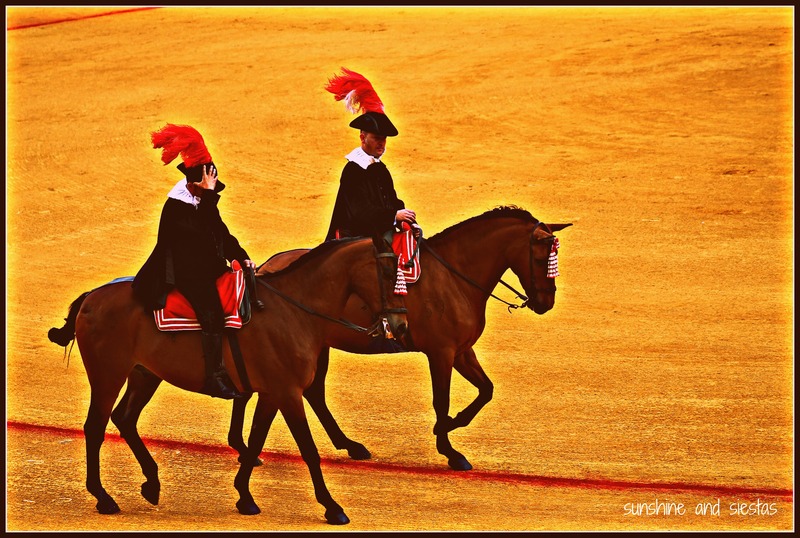 Fully armored, the horses are blindfolded and I cringe as the whole weight of the animal nearly knocks over the horse. A long rod with a hook on the end is driven between Medialuna’s shoulder blades. Conchi’s banderilleros, the three men designated to put the small flags into the bull’s mighty back take wing. The second act of the tragedy comes at a price – the bull is weakened due to the loss of blood, and it seems certain that he will meet his end. The small banderillas are fashioned after the Spanish, Andalusian and Murcian flags, paying homage to Conchi and her cuadrilla (from the region of Murcia) and the plaza. 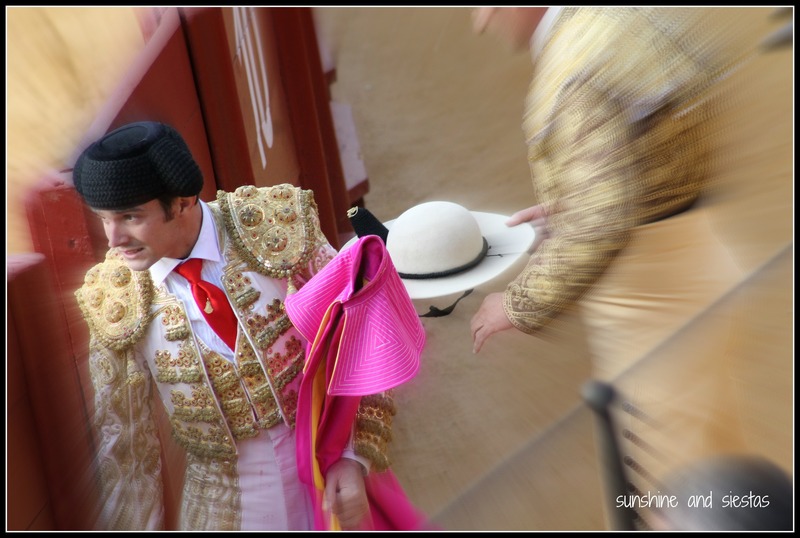 Once the banderillas have been fixed, making the bull look as if it had won ribbons at a state fair, Conchi takes off her montera hat, saluting to the crowd. Now comes the final faena of the fight, where she manuevers the muleta, a small red cape, around the bull, using short grunts and movement to make the animal barge towards her. Though the animal passes far away from her, I’m intrigued by her foray into the sport. Her first attempt to drive the sword between the shoulder blades, thus severing the main artery and killing the bull as cleanly as possible, is unsuccessful. Before the day is out, we’ll see five more bulls from the novilleros all hoping to present themselves as full matadors in the coming years. Álvaro Sanlúcar has a baby face and seems unsure of himself at times, while Emilio Huertas is so convincing in his second faena of the day, the band finally starts playing a paso doble as he puffs out his chest and taunts the creature. “Oh, he’s going places,” says Cait, our resident toro aficionado. His faena is flawless (well, to me) and his efforts earn a standing ovation from the crowd. I take a kleenex out of my purse and wave it in the air, a petition to the judges to award him a special prize – an ear for his bravery and artistry. The ear is cut, and Emilio humbly takes it. Patting backs and hugging commences as he holds it triumphantly in the air and walks slowly around the ring. Fans throw flowers, hats and even painted fans at the young torero. Placing his montera back on his head, he catapults himself out of the ring and leaves the last bull of the evening to Álvaro. He’s a fierce one who charges as soon as he catches movement. By this point, I’m already thinking about dinner (and I love bull tail, for the record). The trio walk slowly back out of the gate designated for them when it’s all over, symbolizing their triumph over death. Not to add fuel to the fire, but have you been to a bullfight? What are your impressions of it? If you’re not into the gory stuff, please vote for me on Kaplan’s How to Teach English blog competion. My entry appeared on this blog last week, and your vote here with my name and blog URL could mean a free iPod for you, too! My crazy is an English teacher and Hemingway obsesssssed! Have you read The Paris Wife? Such a great story! I have never been to a bull fight and I don’t think that I ever will, despite the fact that I live in Spain. Having said that, this post gives a interesting insight and the photos are amazing. The colours are just fantastic. Thanks, dear! My reason for wanting to go was to play around with my camera, and I’m happy with the results. I did a little effects doctoring on picmonkey, which is free and a lot of fun to use. 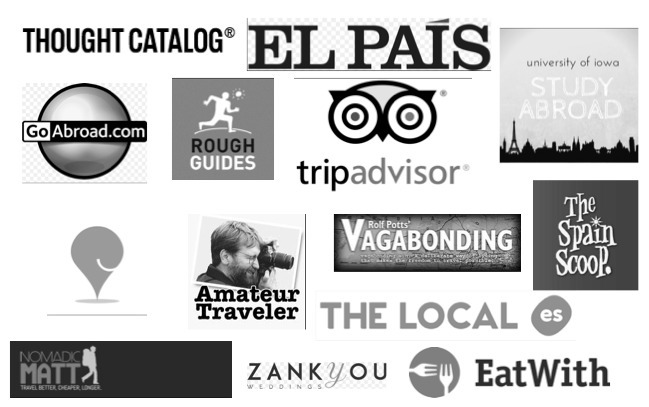 And, if you haven’t been to a bullfight yet, there’s probably a reason why! Beautiful photos. 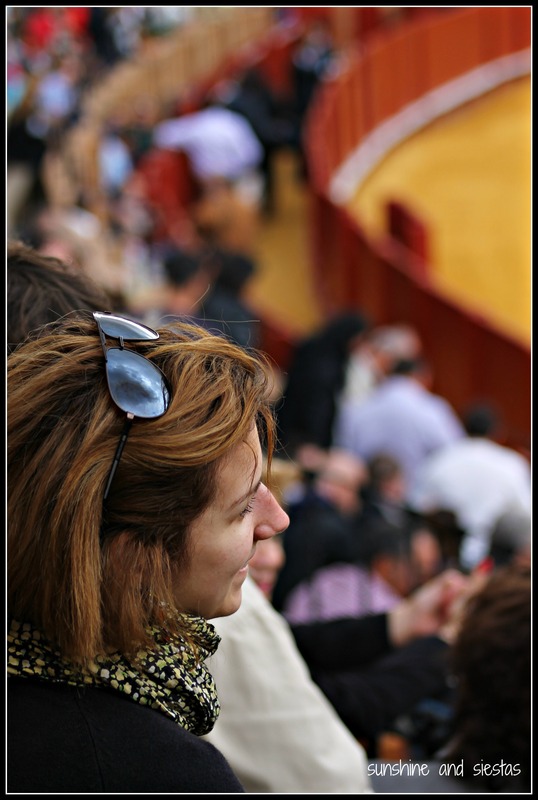 I went to a bullfight in Madrid and was seated across from the King & Queen’s box. The whole scene was amazing. Thanks! The whole thing is a strange mix of contrasts (like Spain! ), but you can blame Camarón for this trip! I’m so against this “sport.” Having said that, these pictures are absolutely phenomenal!!!!!! The 1st one needs to be in a magazine. I can’t say I like it either. Regardless, the trajes de luces fascinate me, and I was watching the people around me more than the actual fight! My camera was the real reason I wanted to go, and I’m happy with the results. Thanks for the huge compliment! I read this fantastic article after I have watched adventurous documentary recently on bull fighting on http://topdocumentarystream.com/american-bullfighter/. Interesting! Great, great photos! And it seems that you got all the potential highlights all in one bullfight! I’m glad I went to Ventas, but I won’t be making a habit of it. After my research, the culture of the toros has turned out to be incredibly rich and engrained in Spanish culture. It would be a shame to brush that aside. Thanks, Shawn! With your eye and expertise, I expect great things in your (um, incredibly awesome) post for Huff. As for the habit making, I had a friend take my visitors yesterday. Once every three years is enough for me!